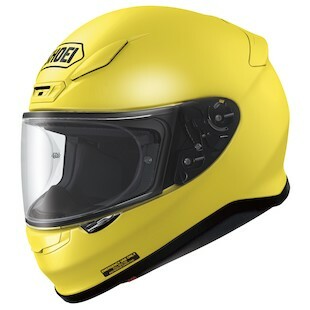 We have the biggest news from the helmet world all year: Shoei has released the brand-new RF-1200! And when I say brand new, I mean brand new. The Shoei RF-1200 Helmets have a new shell shape, a new interior, a new face shield and a new base plate system. The RF-1100 was one of Shoei’s most popular, best selling helmets, and they are pulling no punches with this replacement. Let’s dive right in and geek out on the details. Working from the outside in, the only thing familiar about the Shoei RF-1200 shell is the multi-ply composite shell construction found on the RF-1100. The 1200 has a new external shape meant to be more compact and lightweight. Shoei also spent time in wind tunnel development, which has changed the aerodynamics and ultimately resulted in a noticeable reduction in wind noise. Despite being smaller, quieter, and lighter, the RF-1200 shell manages to provide the same legendary level of strength and safety, making it what Shoei claims is their lightest Snell-certified full-face model. Moving onto the interior, the RF-1200 features a dual-layer EPS liner with improved direct ventilation behind a fully removable, washable, and adjustable liner. The EPS liner benefits from wind tunnel testing and strikes a balance between great airflow and a quiet ride. 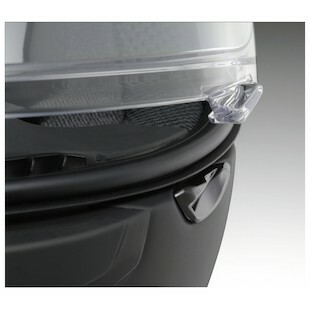 There are three upper air vents, one chin vent, and four upper exhaust vents that will help you keep a cool head. Coming back to the liner and cheek pads, Shoei is offering multiple thicknesses of cheek pads to fine tune the fit of the RF-1200, and the liner has been optimized to fit the contour of your head. Also, the cheek pads feature a quick release system borrowed from the X-12 which lets first responders safely remove the helmet without pulling on a rider’s neck. The internal head shape of the RF-1200 will remain the same as we have grown accustomed to with the RF-1100 -- Good news here, since the intermediate oval shape of the RF-1100 struck a chord with quite a few riders. The next big change on the RF-1200 is the new CWR-1 face shield. First off, this is great news for those living in cold, damp climates: the new face shield is Pinlock ready, and the RF-1200 comes with a Pinlock lens included. The new face shield is also thicker overall compared to the RF-1100, while maintaining optical clarity. There are reinforced ridges at the top and bottom of the shield to improve rigidity, and to provide a better seal against the weather gasket. Slightly controversial is the switch from a lever shield locking mechanism on the base plate to a simple locking tab on the bottom of the face shield itself. The new locking tab is quicker to use, but you lose the option of locking the shield in a cracked position. The simpler shield lock mechanism allowed for an upgrade in the base plate on the RF-1200, though, and now incorporates a five position adjuster. 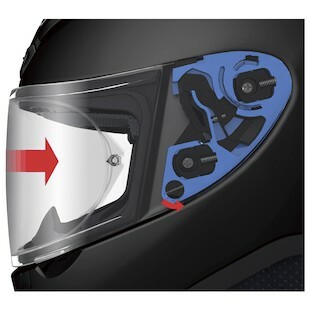 Think of this as a preload setting for your face shield; you have five tension settings you can easily switch between to adjust how the face shield seals with the helmet. 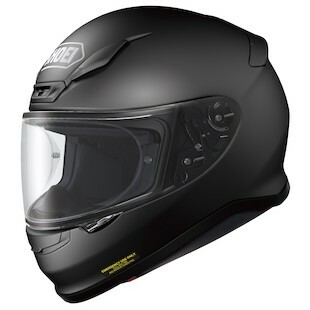 The Shoei RF-1200 Helmet will come in the usual array of solid colors, as well as a few graphic designs. There is a Hi-Viz option with the Beacon graphic, which is great to see as an option for all of our Hi-Viz enthusiasts. The solid color also sports a bright yellow, called Brilliant Yellow, though not technically considered "Hi-Viz." Now that I have bored you with the technical details, it is time for some seat-of-the-pants impressions. We love this helmet. It has caused quite the buzz in the RevZilla office, and we expect it to be the next bread-and-butter product for Shoei. It is comfortable, well made, and looks fantastic. Shoei has taken a great product and made it better, which is quite a feat considering how good the RF-1100 has treated us. How could you go wrong with that?